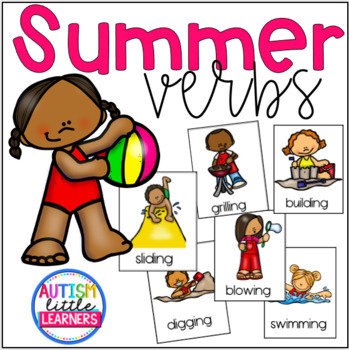 In this preschool summer themed verb activity, you will find tried and true activities to encourage language development in early learners. I use these with my students with autism spectrum disorders and other moderate to severe language delays to encourage language development. 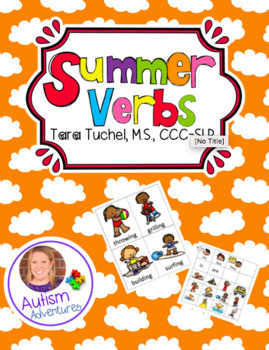 The verb activity includes 12 summer themed pictures of verbs. 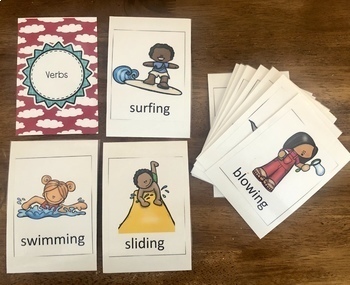 These can be used for expressive labeling and receptive identification of the summer themed verbs. A visual communication board is included for children who have limited verbal skills (so they can be used to label the verb flashcards). The pictures can also be used to create file folders for matching pictures to pictures. Data sheets are also included! 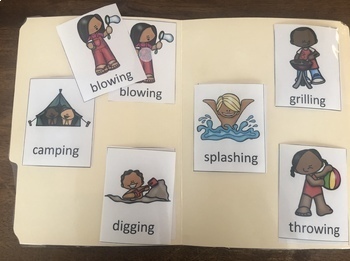 The verbs include: digging, camping, blowing, driving, throwing, building, surfing, grilling, swimming, sliding, running and splashing.